January 2004 - Happy New Year! It's our 10th Anniversary! 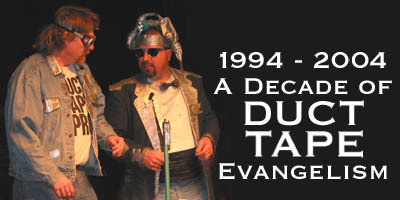 1984 marked the birth of the duct tape books and the Duct Tape Guys. Jim and I (brothers in law) were sitting around Jim's sister's house in a small Wisconsin town the night of Christmas 1993 when a power-outage prevented the preparation of food for the family gathering. Jim (frustrated because of the continual lack of food) commented, "If I knew where that power outage was, I bet I could fix it with duct tape!" "What do you mean, fix it with duct tape?" I responded (having grown up on lesser tapes like masking tape, Scotch transparent tape and my grandfather's favorite, electrical tape). 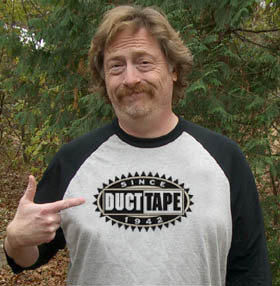 Jim's wife, Kelly, chimed in, "Oh, Jim fixes everything with duct tape!" They proceeded to list off some of his recent applications of the silver tape and I thought, "There's a book in here!" So I went out to the car, grabbed my laptop (battery charged, fortunately), and we all sat around in the dark brainstorming uses for duct tape. In three days, we had fleshed out 365 uses for duct tape for what was originally going to be called, "The Duct Tape Diary." Returning home, I laid out a book proposal, including illustrations, and sent it off to five publishers. By March, "The Duct Tape Book" was well on it's way to being published thanks to our first editor, Tony Dierckins (who rescued the manuscript from the reject pile). Since that first book, we have sold over 1.5 million books and also Duct Tape Page-A-Day® Calendars every year since 1997. We are currently working on our seventh book (more news on that title next month), and are traveling all over North America doing our duct tape stand-up comedy (primarily at Home and Garden Shows and corporate meetings). Always great gift ideas for the duct tape lover in your life! Visit the Duct Tape Pro Shop to see our new shirt designs and great deals on books, videos, mugs, diplomas, and more! 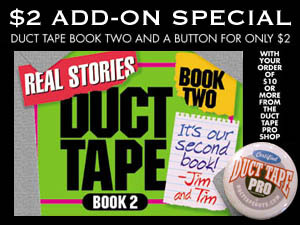 Make sure you order more than $10 of stuff so you qualify for our $2 add-on special (a duct tape book and button - $8.95 value - for just $2 additional). NEW Emailing List. Subscribe Now! (We are scrapping our old list, and using a new, steamlined list that will allow you to subscribe and unsubscribe more easily.) Click here to get on the new list now! Buy our sixth book, The Duct Tape Halloween Book online at the Duct Tape Pro Shop and get a copy of the Ultimate Duct Tape Book absolutely FREE! New Shirt! 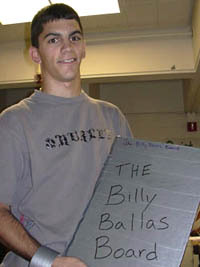 Baseball-style vintage shirt with 3/4 length black sleeves and duct tape gray body. Sports one of two designs - see them both now in our Duct Tape Pro Shop. SECRET SAVINGS LINK For our newsletter readers only: Click the little white radio on the main page of the Duct Tape Pro Shop and get our $12 video for only $4.50! done at that time; however, no gift should be over $10. Regarding the anonymous note I received from a member of Alcoholics Anonymous requesting a non-drinking table, I'm happy to accommodate this request, but, don't forget, if I put a sign on the table that reads, "AA Only," you won't be anonymous anymore. In addition, forget about the gifts exchange-- no gifts will be allowed since the union members feel that $10 is too much money. I've arranged for members of Overeaters Anon! ymous to sit farthest from the dessert buffet and pregnant women closest to the restrooms. Gays are allowed to sit with each other. Lesbians do not have to sit with the gay men; each will have their own table. Yes, there will be a flower arrangement for the gay men's table. Happy now? People, people -- nothing sinister was intended by wanting our CEO to play Santa Claus! Even if the anagram of "Santa" does happen to be "Satan," there is no evil connotation to our own "little man in a red suit." Vegetarians -- I've had it with you people!! We're going to hold this party at Luigi's Open Pit whether you like it or not, you can just sit at the table farthest from the "grill of death," as you put it, and you'll get salad bar only, including hydroponic tomatoes. But, you know, tomatoes have feelings, too. They scream when you slice them. I've heard them scream. I'm hearing them right now... Ha! I hope you all have a rotten holiday! Drive drunk and die, you hear me? For those of you in the warmer climates, moving your car for snow removal is a common occurance (especially in the city). say, "We are going to have 8 to 10 inches of snow today. You must park your car on the even numbered side of the street, so the snowplow can get through." The next week they are having breakfast again when the radio announcer says, "We are expecting 12 to 14 inches of snow today. You must park... " and the power goes out. Norman's wife is very upset, with a worried look on her face she says, "Honey, I don't know what to do. Which side of the street do I need to park on so the plow can get through?" With the love and understanding in his voice that all of us men who are married to Blondes exhibit, Norman says,"Why don't you just leave it in the garage this time?" Bethel Coed Conehead Jay, of Bethel College, St. Paul, Minnesota chose a road construction warning cone and duct tape to create this fashion statement. No further explanation was given - probably none was needed... It's finals week - everybody is going a bit wacko. Nice look, Jay. Click to enter our photo caption contest! Fall-Apart Calendar? Every year, we have people write to us saying that their Duct Tape Page-A-Day Calendar has fallen apart. Until we find a printer who binds with duct tape, click here for step-by-step instructions on how to reinforce your calendar. 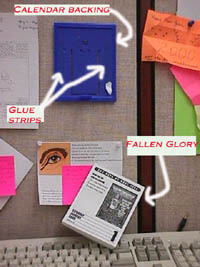 RANDOM WINNER: The random winner of a duct tape book in this issue: Benton Piertay... Congratulations! Send us your mailing address and we will send you an autographed Duct Tape Book.